Summer brings with it the familiar drone of insects. Earlier this week an unfamiliar humming sound brought my attention to a group of insects hovering low to the ground over a patch of sand. 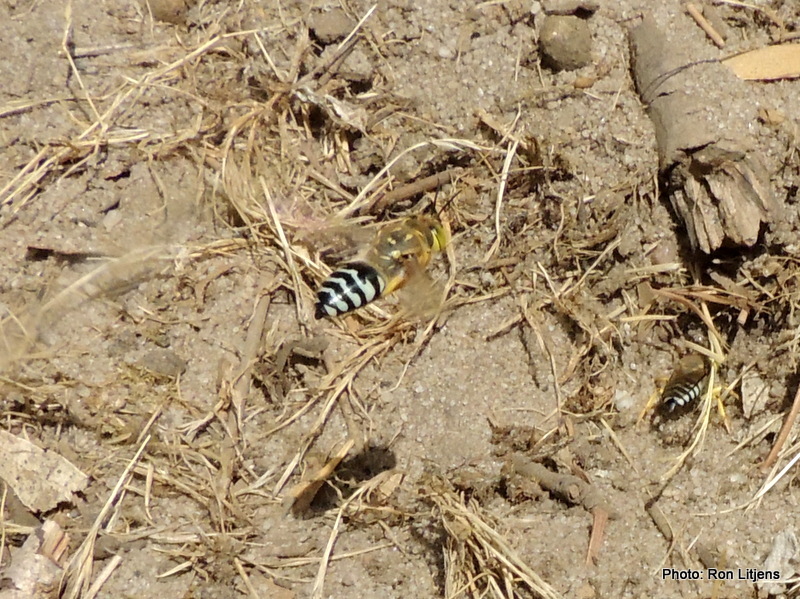 They looked like a cross between bees and large blowflies and turned out to be Sand Wasps, pictured left (click to enlarge). 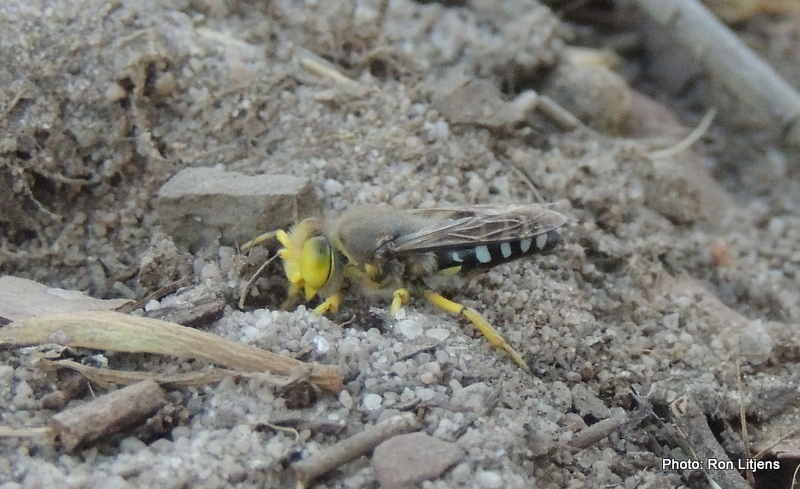 Sand Wasps (Bembix sp.) are a genus of solitary hunting wasps found throughout Australia. They are characterised by large mandibles which the female uses to dig tunnels and catch prey. The adult insects are nectar feeders. The female wasp can deliver a painful sting but these wasps are not aggressive when disturbed. During breeding season the female wasp will dig short tunnels in the sand using its large mandibles and legs (picture right). In this burrow it will lay an egg and subsequently will hunt for flies, catching them on the wing and paralysing them. The flies are deposited in the burrows and the hatched larvae feed on them. The burrow is sealed to prevent intruders eating either the flies or the larvae. A group of sand wasps may build a series of burrows close together but there is no cooperation between them. I noticed several things while watching the activity. The sand obviously has to be the right consistency to build a tunnel. In many cases the sand collapsed into the tunnel as quickly as it was being excavated and a new tunnel had to be started again where the sand was more solid. Secondly, the wasps seemed to fly around in pairs and while one wasp landed to commence digging the other maintained a hovering vigil above. 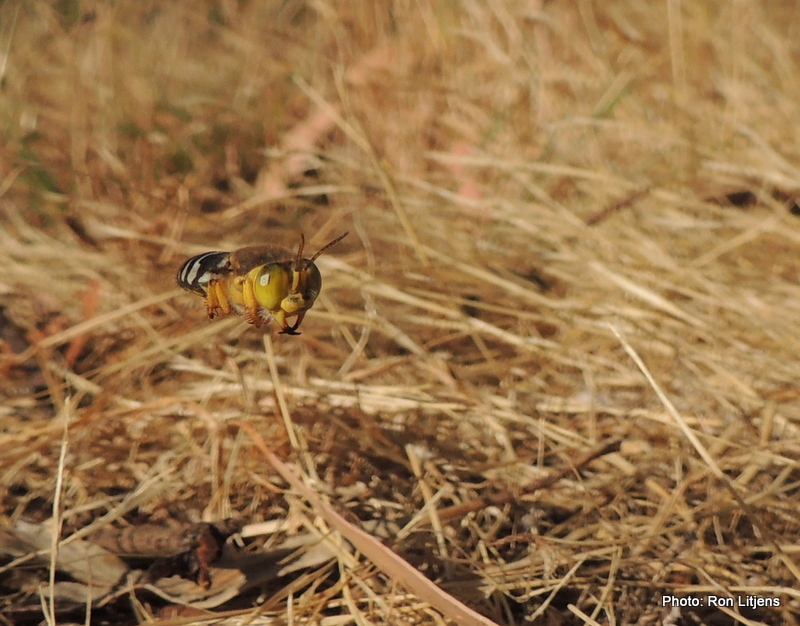 The photo to the left shows one wasp digging with a second wasp hovering above. I know which job I would ‘bags’.